We’re a little over a month away from season four of the award-winning Orange is the New Black and today Netflix released the official full-length trailer for the upcoming season. 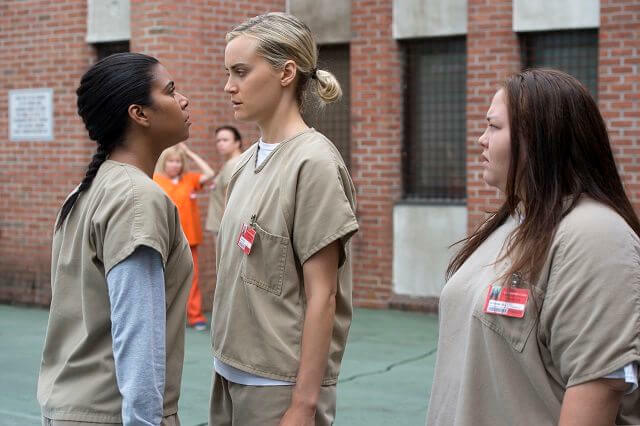 The series is based on Piper Kerman’s bestselling memoir and Jenji Kohan is the showrunner and executive producer. The cast is led by Taylor Schilling and features Uzo Aduba, Kate Mulgrew, Laura Prepon, Laverne Cox, Dascha Polanco, Danielle Brooks, Selenis Leyva, Samira Wiley, Taryn Manning, Yael Stone, Jackie Cruz, Lea DeLaria, Adrienne C. Moore, Elizabeth Rodriguez, Michael Harney, and Nick Sandow. All 13 new episodes of Orange is the New Black will be available for your binge-watching pleasure on June 17, 2016. The Plot: The newest season of Orange delves into the racial and economic tensions that run rampant in the halls of Litchfield. Overrun with new inmates and overseen by inexperienced guards, the prison undergoes an unprecedented culture war.